The recent rise in nonprime mortgage foreclosures has opened a new and costly chapter in many of the nation's most distressed urban neighborhoods. Particularly problematic is the fact that today's foreclosures impose significant costs not only on borrowers and lenders, but also on municipal governments, neighboring homeowners and others with a financial interest in nearby properties. While there is an extensive literature on the impact that delinquency, default, and foreclosure have on lenders, borrowers, and other entities that are direct parties to the mortgage transaction in question, the costs that these mortgage failures impose on municipalities and other third parties are far less well understood. This is due to two factors. First, municipal and other third party costs are difficult to identify, and therefore often go undetected. Second, even where identified, the activities that generate costs often blend in with other governmental functions, or are otherwise difficult to quantify, reinforcing the tendency for them to remain invisible. This study attempts to fill that void. 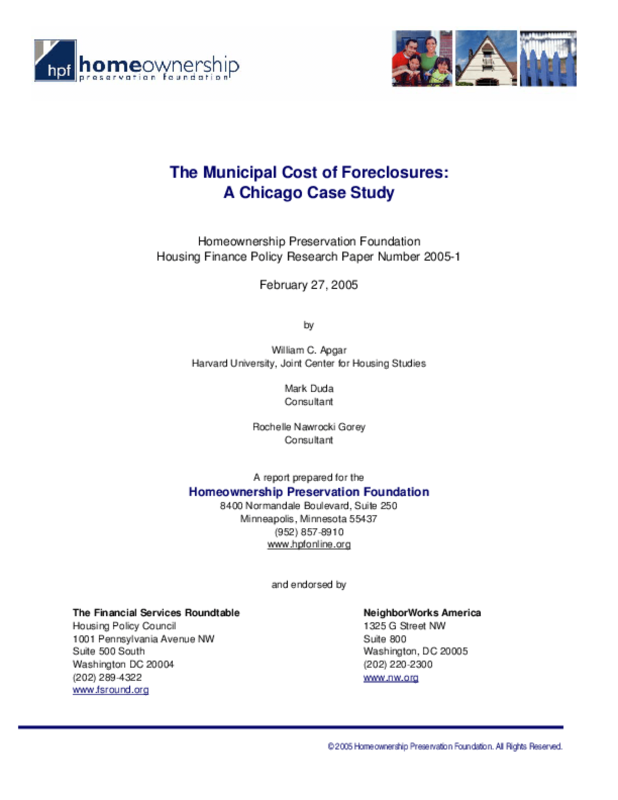 Using the City of Chicago as a case in point, this study presents a conceptual framework that makes explicit the various costs of foreclosure, especially as they relate to local governments and courts. By carefully reviewing the foreclosure process as it plays out in Chicago, the paper isolates 26 separate costs incurred for the provision of 'foreclosure related services.' These costs reflect actions undertaken by 15 separate governmental units that are part of the overall municipal infrastructure underlying the foreclosure process. While in some cases these municipal activities are limited to simple and relatively inexpensive ministerial duties of agencies like the Recorder of Deeds, in more complex foreclosure scenarios these municipal costs can reach tens of thousands of dollars. In extreme cases, the concentrated foreclosures can put downward pressure on area property values and indirectly rob area homeowners of hundreds of thousands of dollars of home equity.